Ridley Scott is one of my all-time favorite directors, and I consider Russell Crowe and Denzel Washington to be some of the finest actors working today. So putting them all in one movie together was enough to make me buy a ticket. And thankfully, all this talent is put to very good use. American Gangster tells the story of Frank Lucas (Washington) and Richie Roberts (Crowe). Lucas is a man with a keen sense for business, and his business is drugs. Cutting out the middle-man, he gets his heroin directly from the manufacturer, and sells it at half the price. Roberts seems to be the one cop who isn’t crooked on the East Coast, so he heads up a special Narcotics division of the FBI, Lucas becoming the target of his investigation. But the story is about so much more than that. In Lucas, we get a character who is deep and complex. He’s seemingly the antagonist of the story, but you can’t call him an evil person. Duality plays a major role in the story, and Lucas represents it; he gets his money by selling drugs, and uses it for his family and friends. He sees selling drugs as simply a business; supply and demand. It’s fascinating to watch, a combination of Steve Zaillian’s superb script and Washington’s career-defining performance. Richie Roberts is also a very interesting character. At first, the audience isn’t sure how to feel about this guy. He’s not particularly likeable at the very start, but as the movie goes by, he becomes an extremely relatable character whom the audience is rooting for every step of the way. In contrast, Lucas starts the movie as the likeable guy who we want to know more about; by the end, we want him in jail. Russell Crowe also gives an excellent performance as Roberts. It’s not as much of a strain for Crowe as some of his other roles, but he’s perfect for the part. As I mentioned above, Steve Zaillian crafted quite the screenplay for this movie, showing historical events and also making it a deep character study. I can’t vouch for how accurate this movie portrays events. Various sources have said its either 90 percent true or 90 percent false, but true or false, this is a great story to see. Ridley Scott, one of the best current directors, helms the project with his usual flair for the visual, while not forgetting about character. Every shot bursts with life, a trademark of Scott. He pulls the best out of his actors, and while the film is different from most things the director has done in the past, it definitely has the man’s stamp on it. On DVD, we’re treated to two versions of the film. First is the original theatrical cut, and second, the highly-advertised Extended Edition. A big marketing piece for this DVD has been the “18 minutes extra footage,” and while I’m sure there are 18 minutes of new footage, it isn’t all that substantial in a film that’s 160 minutes long to begin with. The new scenes only serve to drag out the film. Most of them are redundant, unnecessary, or make little sense in the context of the story. One of the best things about the theatrical cut is how tight a film it is; not a scene is out of place, and the 160-minutes fly by. The extended cut only puts a wrench in that. The extended cut also includes an alternate ending that I don’t much care for. It’s cool to see, but the ending in the theatrical cut was just perfect; perhaps the best final shot of any film in 2007. (WARNING: SPOILERS) The theatrical cut ended with Lucas stepping out of prison, poor and out place in the 1990’s. The new ending has Roberts waiting for him, and they have a cup of coffee together. Lucas explains how out of place he feels in this new era. Basically, the new ending just spells out all the unsaid things in the theatrical ending, rendering it unnecessary, and dumbing down some of the intelligence of the film. If you like you’re endings spoon-fed to you, then the extended cut is the way to go. But I definitely prefer the theatrical cut. Whatever version you like, they’re both on Disc One of this two-disc DVD set via seamless branching (meaning the disc just splices in new scenes when needed). This creates a bit of a problem on the video quality front. Even without the extended cut present, this film is just too long to be on one disc; it should have been split over two discs, or put on two sides of a flipper, because video problems are rampant on the image. Colors appear either muted or washed out in some scenes, especially dark indoor images. Contrast is just awful; all the colors that should be black appear gray and, many times, fuzzy, which is very distracting. This is especially true in dark scenes, where you can barely tell what’s going on. Detail is muffled much of the time, especially visible in the character’s hair and facial features (when viewed from a distance). Most of these are compression issues, made from cramming 3 hours of video, an audio track, and a commentary onto one disc. That’s not to say the image isn’t watchable. When not affected by contrast, colors are usually solid (outdoor scenes most notably). Detail is very good on close-ups and sets, and none of the problems become too distracting, except for very dark scenes. You’ll probably only notice these problems when watching the film on a widescreen TV, but because many people own anamorphic displays, with the number only increasing, video quality should have been better than this. DVD’s are cheap to manufacturer, so throwing in another disc to split the film over shouldn’t have been a big deal. The audio is better, though not a home run. Overall, dialogue takes center stage, with the music staying quiet and never overpowering. Sound effects do their job nicely, but the audio lacks a crispness that most audio tracks usually have. Again, this would be a non-issue is the film were split over two discs. Moving on to the extras, Disc One presents an audio commentary with director Ridley Scott and writer Steve Zaillian. Scott always does a good job on audio commentaries; he has a lot to say about his movies, and American Gangster is no exception. Scott usually flies solo, but the assistance of Zaillian is only a benefit. On Disc Two, we’re treated to three options. First is the Deleted Scenes section, which contains a 45-second Alternate Opening. It’s the same idea as the opening for the real movie; Lucas kills someone in a tense opening moment. It doesn’t work as well as the real opening, but is cool to see because it contains footage that was heavily used in marketing. There’s also the 3 minute Frank and Eva’s Wedding, which is just an extended version (in the church) of the couple being wed. The hefty chunk of meat on this disc, however, is the documentary Fallen Empire: Making American Gangster. Although advertised as a feature-length documentary, it’s really a series of five featurettes. When you hit “Play All,” they play as one movie, but they don’t fit together in any overtly logical order, and are best viewed as featurettes. Things start with the 21-minute Tru Blu: The Real Story. This is the coolest featurette on the disc, because it has interviews with the real Richie Roberts and Frank Lucas. It’s strange seeing Lucas in interviews, because of the terrible empire we learned about in the film. But he doesn’t try to glorify his actions of anything like that. As in the film, he seems to be a perfectly likeable, if extremely intimidating, guy. We also get the sense that he and Roberts are good friends, which the finale of the film serves to show. Next, we have the 11-minute Killer Threads: Costumes. As it’s name suggests, we learn all about costumes. This featurette should probably be placed after the 20-minute Crime War: Production, but for some reason, the featurette is placed before it. The production featurette skims over the production. We see some good on-set footage, and as always, we get lots of good information from Ridley Scott. There’s also the 9-minute Into the Arena: Ali vs Frazier, which illustrates how the filmmakers recreated the famous fight. There’s some cool information contained here; for instance, we find out that half of the crowd is actually inflatable mannequins. Finally, there’s Rhythm of the Street: Music, Sound, and Editing. It runs 15 minutes, and skims over these three topics. All five featurettes are worth a watch, but I was left wanting more. They really only scratch the surface. I was hoping for a documentary akin to Dangerous Days on the Blade Runner DVD, or The Path to Redemption on the Kingdom of Heaven DVD (both are Ridley Scott films). There’s plenty of good information here, but a real, feature length documentary outlining the production from conception to release would have been even better. You get some of the best insight watching the Case Files, which are essentially unfiltered documentary footage from the set. In all three, there are no interviews or narration. It’s just Scott and his team at work. This is cool to see because you get a good glimpse into Scott’s directorial process. All three run about 8 minutes. The first, Script Meeting, is Scott and the real Richie Roberts talking to screenwriter Steve Zallian. Heroin Test Show and Tell features Scott learning about the process of how heroin is diluted and manufactured, and figuring out how to film it. Finally, we have Setting up the Takedown, which is the best of the three. We get to witness Scott on set, giving his instructions. It’s a great glimpse into the creative process, but like everything else on this disc, it’s sadly just a glimpse. Overall, this isn’t a bad batch of extras. It’s quite good, but I wanted more from everything. They just scratch the surface, but considering this 2-disc set is being sold at the price of a normal, 1-disc set, it’s an impressive batch of goodies. It should be noted that there is a 3-disc set available. This is simply the 2 disc set with a third disc containing some TV specials about the film. I’m very glad to finally have this movie on DVD, even if the overall package is somewhat underwhelming. It’s a great watch, and I can see myself viewing it many times over. 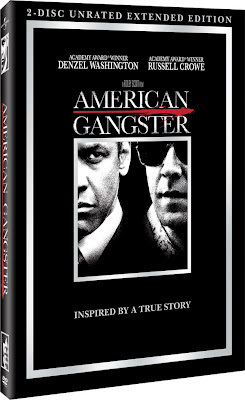 Considering the massive quality of the film, and that you do get quite a few good extras for the price of a one-disc set, American Gangster on DVD gets my high recommendation.